How much money will you need in retirement? Two popular rules of thumb outline the answer. The "Multiply by 25" rule and the "4 Percent" rule are often confused with one another, but they contain a critical difference: one guides how much you should save, while the other estimates how much you can safely withdraw. Let's take an in-depth look at each of these so you're clear on both. The Multiply by 25 Rule estimates how much money you'll need in retirement by multiplying your desired annual income by 25. For example, if you want to withdraw $40,000 per year from your retirement portfolio, you need $1 million dollars in your retirement portfolio. ($40,000 x 25 equals $1 million.) If you want to withdraw $50,000 per year, you need $1.25 million. To withdraw $60,000 per year, you need $1.5 million. This rule-of-thumb estimates the amount that you can withdraw from your portfolio. It does not factor for other sources of retirement income, like any pensions, rental properties, Social Security, or other income. Why that much? This rule-of-thumb assumes you'll be able to generate an annualized real return of 4 percent per year. It assumes that stocks, over the long run (15-20 years or more), will produce annualized returns of roughly 7 percent. Investing legend Warren Buffet predicts the U.S. stock market will experience 7 percent long-term annualized returns over the next few decades. Meanwhile, inflation tends to erode the value of the dollar at roughly 3 percent per year. It means your "real return" — after inflation — will be about 4 percent. 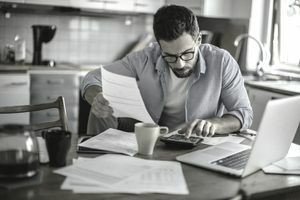 The 4 Percent Rule is often confused with the Multiply by 25 Rule, for obvious reasons — the 4 Percent Rule, as its name implies, also assumes a 4 percent return. The 4 Percent Rule, however, guides how much you should withdraw annually once you're retired. As the name implies, this rule of thumb says you should withdraw 4 percent of your retirement portfolio the first year. The $28,840 figure might be more than 4 percent of your remaining portfolio, depending on how the markets fluctuated during your first year of retirement. Don't worry about that — you only need to calculate 4 percent once. The guideline says you should withdraw 4 percent during your first year of retirement, and continue withdrawing the same amount, adjusted for inflation, each year after that. The Multiply by 25 Rule estimates how much you'll need in your retirement portfolio. The 4 Percent Rule estimates how much you should withdraw from your portfolio after you're retired. Some experts criticize these rules as being too risky. It's unrealistic to expect long-term annualized 7 percent returns, they say, for retirees who keep most of their portfolio in bonds and cash. People who want a more conservative approach opt for a Multiply by the 33 Rule and the 3 Percent Rule. Multiplying by 33 assumes you'll have a "real" return — after inflation — of 3 percent. That represents a 6 percent long-term annualized gain, minus 3 percent inflation. Some dismiss this approach as too conservative, but others argue that it's appropriate for today's retirees who are living longer and want manageable levels of risk in their portfolio. If you're 10 years from retirement, multiply by 1.48. If you're 15 years from retirement, multiply by 1.8. If you're 20 years from retirement, multiply by 2.19. If you're 25 years from retirement, multiply by 2.67. Let's assume that you want to withdraw $80,000 per year from your retirement portfolio, and you're 25 years away from retirement. Multiply $80,000 x 2.67 = $213,600. It is your inflation-adjusted target. How Much in Extra Working Costs Are You Spending?